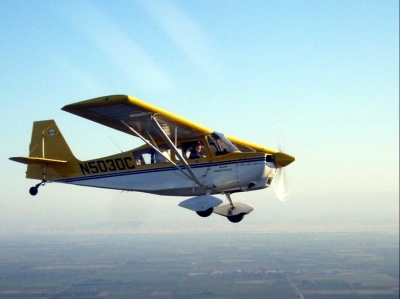 The Fresno County Sheriff's Air Squadron is a non-profit organization of volunteer pilots and aviation technicians offering their skills and aircraft to assist the Fresno County Sheriff in providing public safety and law enforcement. The Air Squadron was formed in 1939 primarily as a search and rescue (SAR) unit and has continued this tradition. Today the Air Squadron activities have expanded to include surveillance, observation and anti-terrorist patrols. Fresno County covers an area of more than 6,000 square miles located near the center of the State of California. The Coastal Range foothills are the western edge of the County at over 4,000 feet. The eastern edge is located in the Sierra Mountains with peaks over 14,000 feet. The Valley is about 300 feet in elevation where the majority of the near 1 million in population reside. East to west the County is 150 miles wide, north to south varies in distance from 30 to 90 miles due to the boot like shape. The City of Fresno is located near the center of the County and is the sixth largest City in California. There are 15 cities in the County and several more communities that require ongoing law enforcement and emergency services that is provided by County Government. Agriculture is the major industry of Fresno County and is the most productive agricultural region in the Country. The expansive land mass and open areas associated with large agriculture operation combined with metropolitan development make law enforcement and emergency services a major undertaking. The assistance of a volunteer air squadron provides assistance not otherwise affordable with current day budget constraints. Currently there are 35 volunteer members and a fleet of 19 privately owned single-engine aircraft. All of the pilot time and use of private aircraft is volunteer time and donated. The Sheriff provides fuel for requested mission flights only. Fresno Air Squadron is a member of Western States Association of Sheriff's Air Squadrons and participates in joint exercises to maintain proficiency in pilot and observation skills. In the event of a regional disaster or emergency the air squadrons of the Western States Association, in coordination with their law enforcement liaison, would mobilize to assist the citizens in need. Patrol and welfare conformations of high profile infrastructure that can be seen from the air. As Pilots and Volunteers of our time and aircraft to the services that are described above, we are hopeful that Garmin will provide sponsorship to our Hotter ‘n Hell Western States training event in July by donating one or two aviation class units for our raffle.